The organizers of the Festival in the Desert are considering an alternative site for 2013. 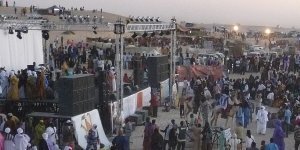 The world famous music festival was originally held in January in the desert near Timbuktu in Mali. Due to the current situation in Northern Mali the organizers have decided to contact the neighboring countries to look into alternative desert sites. They expect to be able to give more detailed information on location and dates on short terms. We will look into the options for our Music journey as soon as more info is available.